This is my hotbox for rooting cuttings and germinating seed. The temperature is controlled by a rod thermostat, which is connected to a soil warming cable. 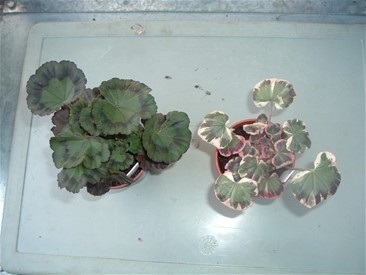 I find 70 degs F (21 degs C) is ideal for rooting pelargoniums. Even with all this cold weather in January my miniatures are putting on plenty of growth. This is a cutting taken from a Miniature Stellar called Newbridge. For a good plant, I only take cuttings from strong growth. 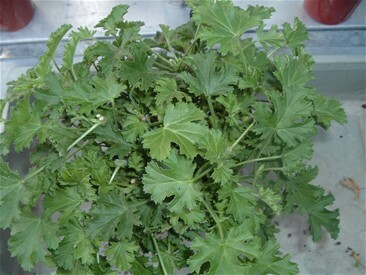 The cutting has been trimmed at a slight angle under a leaf node. As you can see I use small pots to root my cuttings, 1.5" for Miniatures & Dwarfs, 2" for the rest. 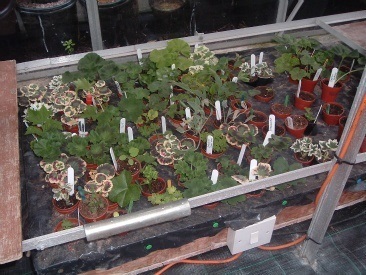 The pots once filled with cutting mix, are then stood in a saucer of water until wet. I then make a hole with a dibber, into which the cutting is placed. Firm the compost around the cutting with fingers, and of course ensure it has a label. 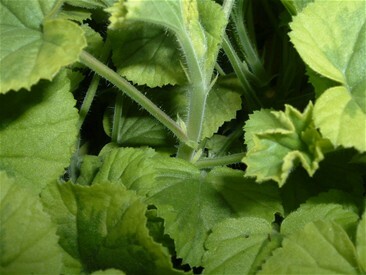 When the cutting dries out it is stood in a saucer of water until sufficiently wet. I do not personally believe in spraying cuttings whilst rooting. 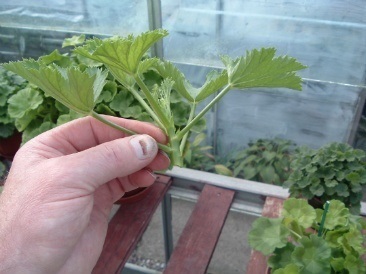 Take strong cuttings which are short jointed as these will give you the best plants. 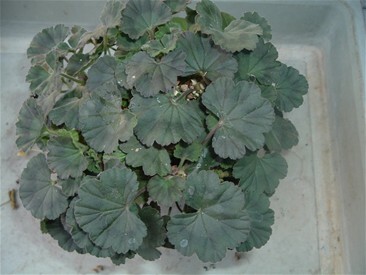 If weak straggly growth is used, once rooted, the plant will have the same lack of vigour. 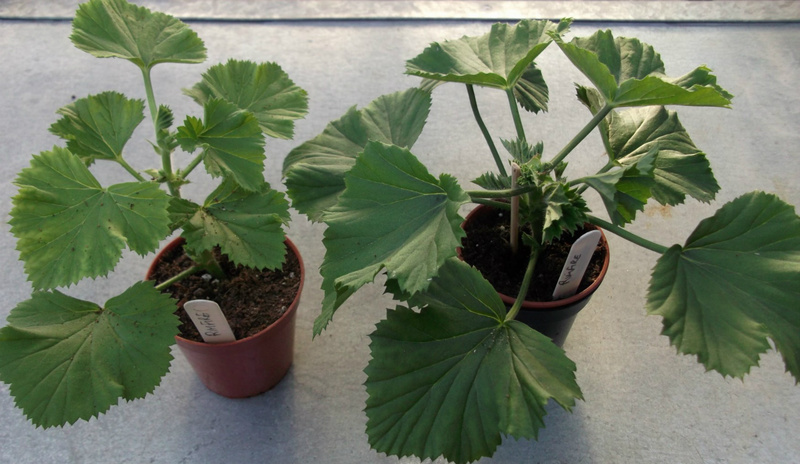 TWO CUTTINGS TAKEN AT THE SAME TIME THE WEAK ONE IS ON THE LEFT. EXCALIBUR CUTTING CLEANED UP AND READY TO BE PUT IN A POT. 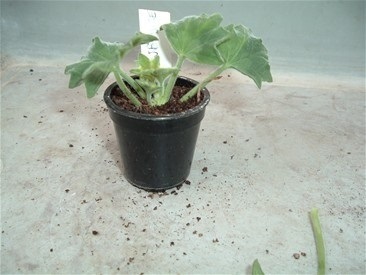 EXCALIBUR CUTTING IN A 4cm POT. 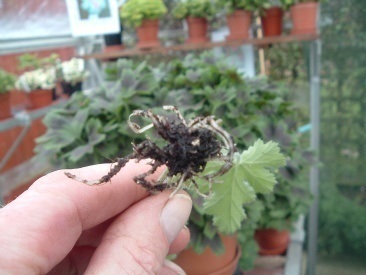 I have taken these cuttings out of their pots to explain & show how the roots are formed. The base of the stem heals over in the first week, the roots appear at the base as you can see in the photo - not out of the sides as some would believe. This is what I do to some of the problem Angels. I take a 2.5" pot, put some cutting mix in the bottom, then place a 1.5" pot in the middle and fill in around the sides with the mixture firming as I go. Any compost that gets in the middle pot is emptied out. 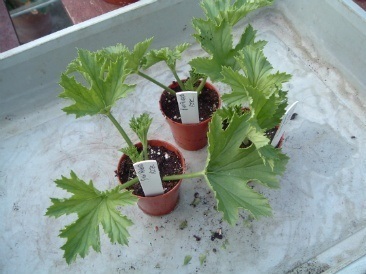 Place the cuttings in between the 2 pots, firming in around each one. As you can see in the photo this works well as all are rooted. I removed a cutting so the inner pot could be seen. 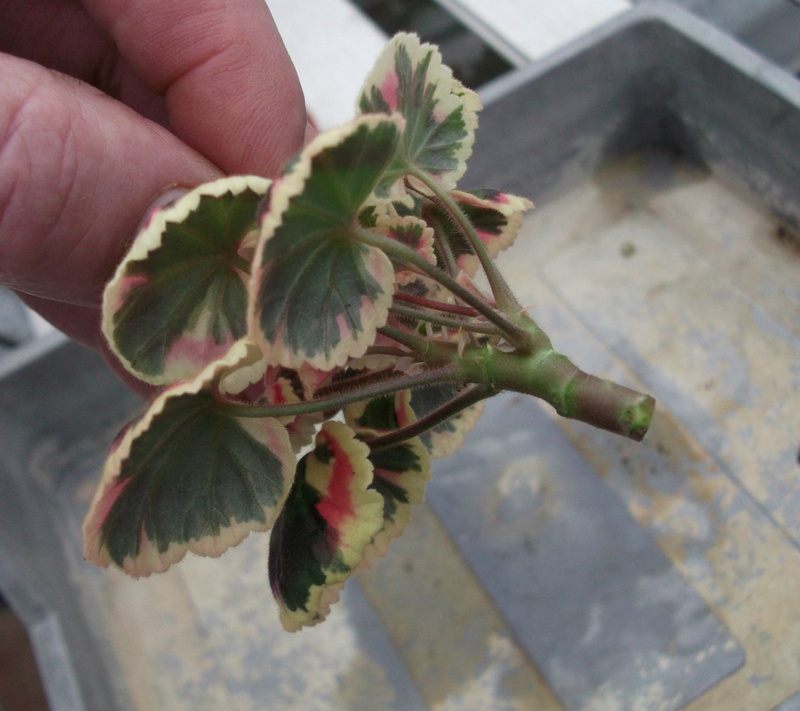 When taking Regal cuttings I use strong growth, like the one in my hand, as it will give a better plant. 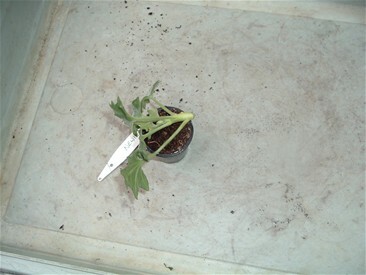 The cutting is cleaned up and cut below a leaf node, then planted in a 2" pot to root, I never use hormone rooting powder. 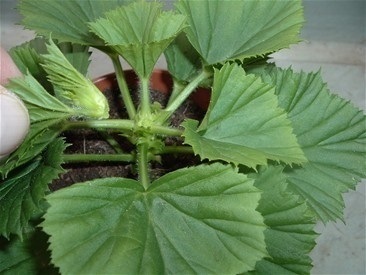 As a rule once a cutting is rooted I remove the growing tip. I treat Regals differently, I let them make a bit of growth first. 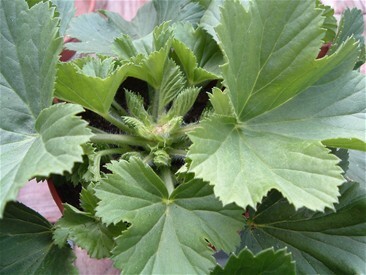 When the cutting has made 4 sets of leaves, as in the photo, the growing tip is removed. 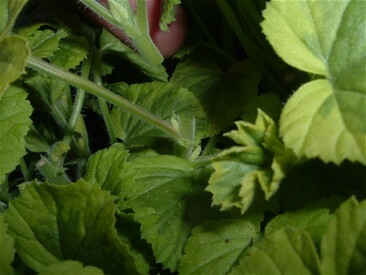 I do not rub out the growing tip with something sharp, but with a knife I take out the growing tip with a set of leaves. This picture shows the breaks that the plant has made before it was stopped. 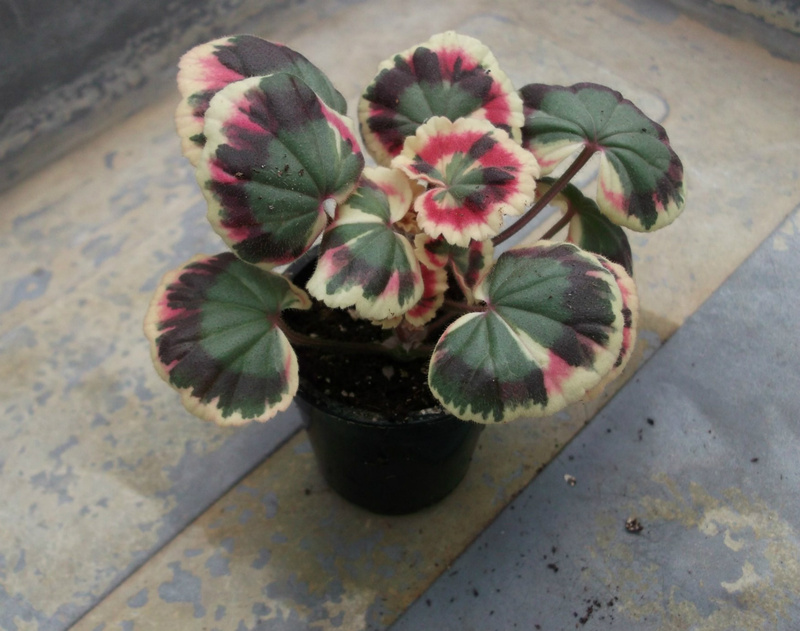 I have found over the years that this produces a bigger more compact plant quickly. 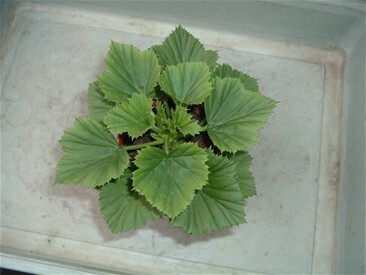 This is a young plant of Rosmaroy a few weeks on after its first stop. Below, Miniatures a few weeks on from the first stop, note how compact they are. Scented Leaf after 3 stops and still in a 4" pot. 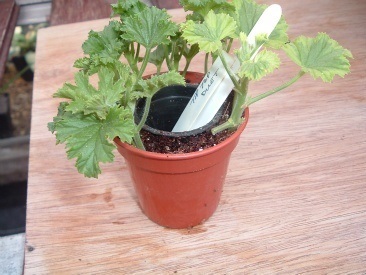 A young plant of Oldbury Duet, it has had 3 stops and still in a 3.5" pot. 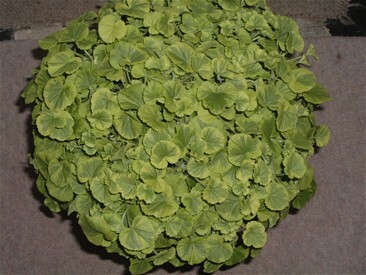 I am not in a hurry to pot on to the next size, as I like to see plenty of top growth first with all my plants. 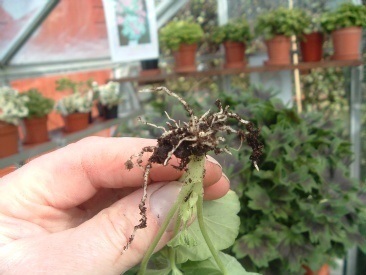 This is Claydon being grown as a Miniature. 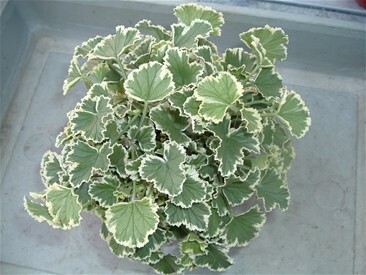 For show purposes the foliage must not exceed 130mm (5") from the rim of the pot. 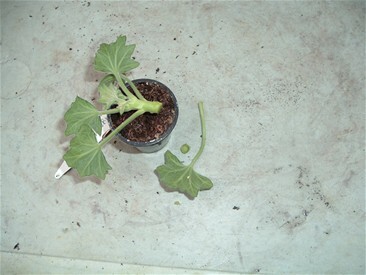 This photo shows a stem from a plant of Sarah Don that I am making the final stops to. 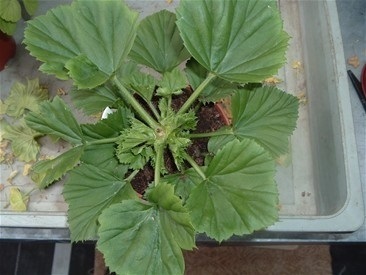 The photo below shows the stem with the growing tip removed, all the plant is treated like this with every growing tip removed. This is the end result with every tip removed, to give as near a round shape as possible.